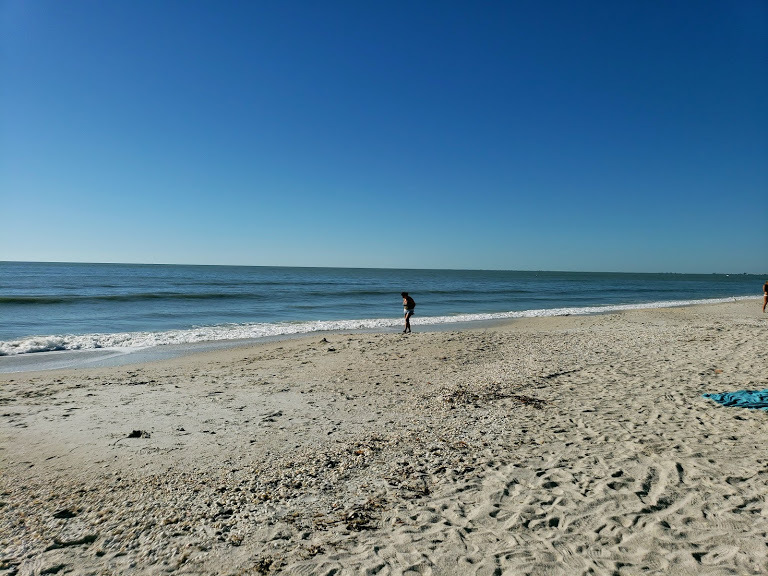 If you are here in Bonita Springs in the off season or even in the should season I can let you in on a little secret about Barefoot Beach Preserve. You can actually visit that state park preserve in the evening and not have to pay to get in. The community of Barefoot Beach is gated and the preserve is at the south end. They stop collecting the fee to enter the park after five-ish. You can enter the community without stopping at the guardhouse in daylight hours, drive through the community to the preserve and then get in for free. It’s a great secret sunset spot. You can avoid a little of the congestion of Bonita Beach, too. Don’t forget to stop by Sweet Melissa’s Ice Cream on your way home, too! You can take the girl off of the farm but you can’t take the farm out of the girl. Oddly I do live in Bonita Farms, though there are no farms located in this part of Bonita Springs any more. I have put the miles on my sneakers burning up and down all the streets that run off of West Terry Street. Right across from Bonita Middle School is a street called Williams Road which leads to River Royale. When you turn on Williams and immediately turn on Boula there is a boat ramp and a family of ducks that hang out. White, Pekin farm ducks … just like the good old days! 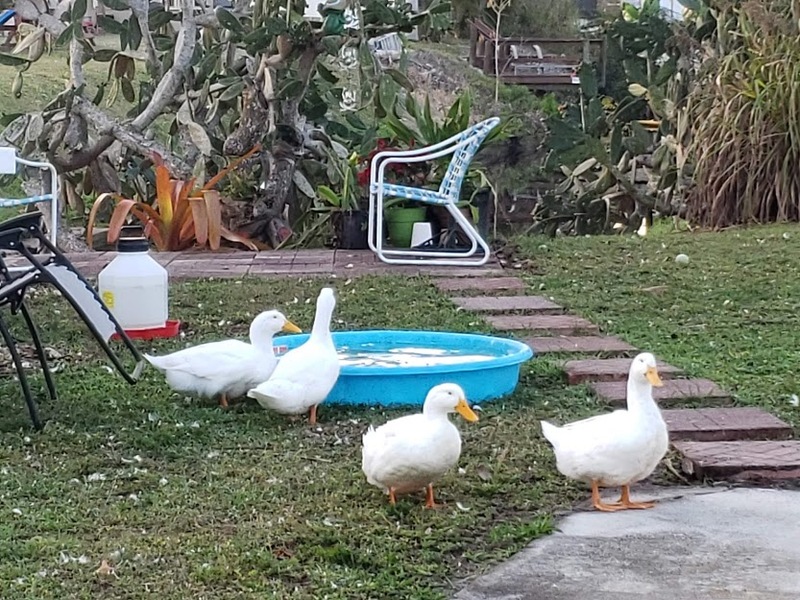 In this area of SWFL we have a lot of Muscovy ducks and mottled ducks so seeing a stark white duck when I was walking was both a surprise and a delight. They literally stand there and eat all day. I have walked with Jen and taken her by them and even driven by with Jerry and a few clients when I am out showing property. They are probably from Rural King which is about a mile away. If you love critters drive by and take a look at them! If you’d like to see Muscovy ducks they frequent both Nuttinglikit Grove and Rio Vista Estates off of Pennsylvania Avenue. Looking for fun things to do with the kids on a rainy day or over a school break? Well, Sky Zone is the stop you need to make. In the event you don’t know, Sky Zone is a trampoline park located in Fort Myers, just North of Gladiolus on US41. We take the kids up there a few times a year. We typically go with everyone in our family and it makes it so much fun. Aiden loves to play dodge ball and shoot baskets. There is a long trampoline alley that leads up to the basket ball hoop which makes it a challenge plus he can jump so high! 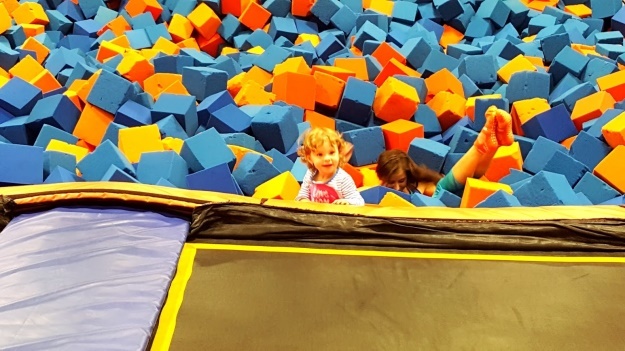 Madison loves the foam pit. We have taken her since she was about two years old. She was very bashful at first but she’s a pro now. The staff at Sky Zone went out of their way to make the littles feel comfortable and learn the ropes. When we leave Sky Zone the kids have gotten all their extra energy out. It is normally a pretty quiet ride back home to Bonita Springs. If we’re not out too late we stop in at Sweet Tomatoes for a bite to eat. It’s a great restaurant buffet so everyone can get a little bit of what they want. If you go plan a little extra time to fill out the electronic Sky Zone registration and waiver. There is a wall of iPads across from the cashier. Also, you will need special Sky Zone socks so plan on needing a little extra money to buy the socks. You can save your Sky Zone socks for repeat visits. 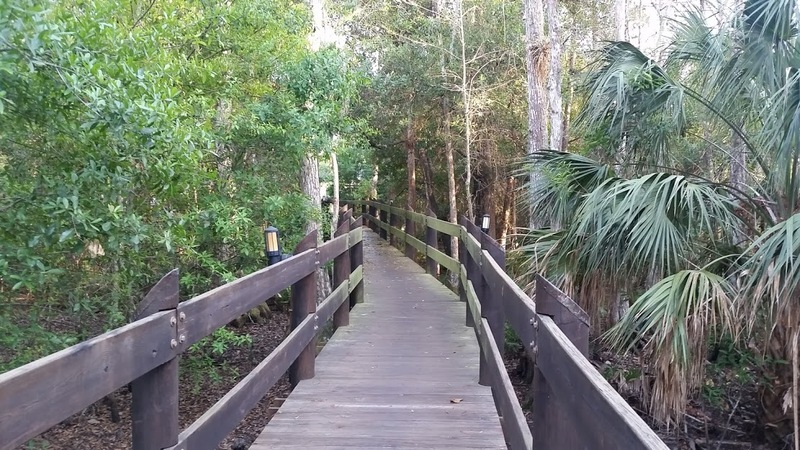 Located in Bonita Springs, hidden in plain site is a little wooden boardwalk path that connects the plaza where One Price Dry Cleaners at Pelican Landing is located to the Bernwood office building that is behind Tokyo Bay Restaurant. The interesting thing about this path is that it’s like being in the middle of a cypress preserve in east Bonita but it’s a stone’s throw to US 41. The boardwalk is wooden and safe for those who have mobility issues or those who have strollers. 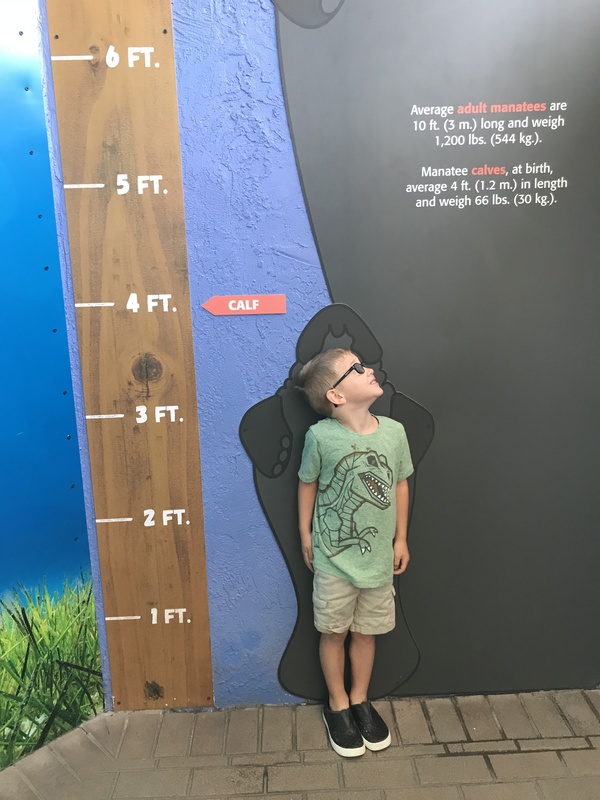 It’s just a couple hundred feet long so if you are looking for fun things to do with kids this would be a fun mini adventure and not cost a thing. Sometimes when we pick up at the cleaners we just take a little walk through to break the pace of the day. If you’re looking for an easy way to take a 15 minute vacation you should definitely locate this boardwalk. We spend our Sunday mornings at Riverside Park attending the Springs of Bonita Church, the outdoor church. After church service we avoid the crowded breakfast spots. Deromo’s Used to be our secret breakfast spot and then the rest of SWFL found it so now we go to Hole in 1 Bagel in Bonita Springs. Hole in 1 Bagel has all of the standard favorites but if you are a picky eater or like things a certain way they are great at creating exactly what you want. 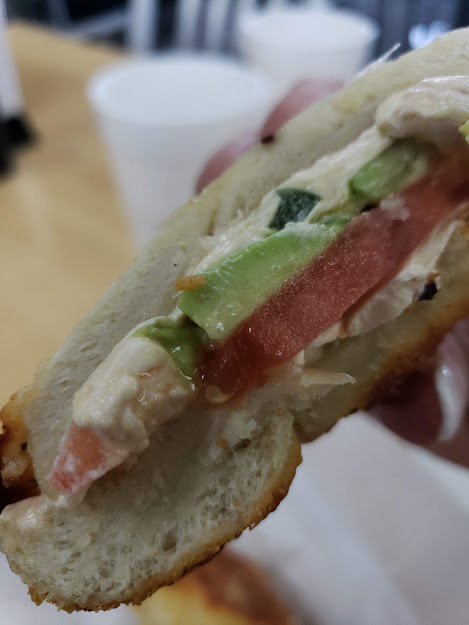 One of my favorites is an everything flagel (which is a flat bagel) with jalapeno cream cheese, tomato slices and avocado. Besides coffee they also offer a variety of soft drinks and you can order smoothies, too. Hole in 1 Bagel is open for breakfast and lunch. They are currently closed on Mondays. The address is 28441 S Tamiami Trail, Bonita Springs, Florida 34135. It’s located right on US 41 in the strip mall where Radio Shack used to be located. If you are looking for fun things to do in Naples, Florida consider dropping by the Naples City Dock. There is never a more entertaining place to people watch than a marina and the Naples City Dock fits the bill. 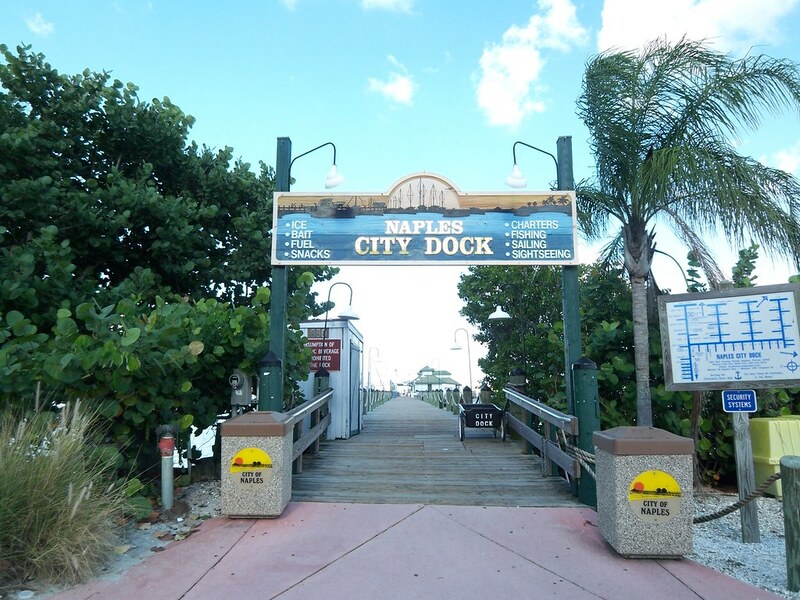 Located in downtown Naples, the dock is very close to a variety of shopping and dining locations. If you’re in the area in the early morning or lunch you can stop by The Cove Inn to get a good old fashioned diner breakfast. The Cove Inn is a local’s hangout and very popular so plan time accordingly if you are dining in peak season or peak hours. Closer to the City Dock is “The Dock at Crayton Cove” restaurant. The dock is a lunch and dinner restaurant providing local fare and seafood such as grouper and shrimp. The City Dock is a stone’s throw from the doors of this restaurant. So go sit in the breeze on the dock at the City Dock at the Bay and watch the tide roll away. Celebrate Bonita Festival 95/365 Things to Do? 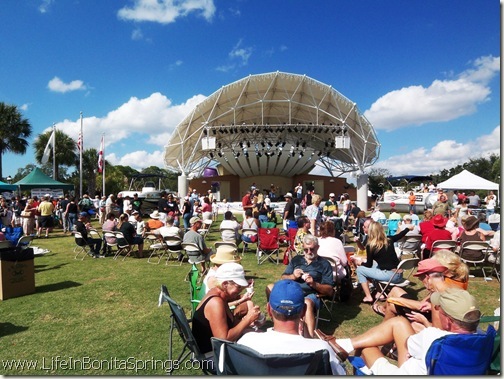 Every spring the city of Bonita Springs holds a festival called Celebrate Bonita. Celebrate Bonita is an outdoor concert and festival held at the band shell at Riverside Park in Downtown Bonita Springs. The event itself is casual and laid back. The concert is free. There are generally a few food and beverage vendors on site. Proceeds from sales of beverages benefit the Bonita Assistance Office. If you plan on attending Celebrate Bonita know that parking can be tight. If the city lots are full you may want to look for side street parking in the general area but a few blocks away from the venue. Pets are usually frowned upon at the events. There is no seating furnished so be sure to bring a blanket, towel or folding chair. Be sure to reach out to us for the current calendar of events at Riverside Park so you don't miss Celebrate Bonita. Our family has to regularly travel an hour and a half to the Sarasota area to see a pediatric eye specialist. When we make the trip we always try to find fun things to do along the way. With two little people in tow these fun stops are important. Our last trip to Sarasota, Florida brought us to Mote Marine Laboratory and Aquarium. The best part about the Mote Marine is that their goal is to educate the public about protecting our oceans. There is so many different types of sea animals and creatures from sea turtles, manatees, jellyfish, seahorse and so much more! If you have kids visiting Mote Marine is a fun thing to do in Southwest Florida. It’s a must-do if you are planning a day trip and a why-not if you find yourself in the area. Mote Aquarium is located at 1600 Ken Thompson Parkway and is open 365 days a year (including holidays) from 10am to 5pm. If you are looking for fun things to do with kids on a holiday don’t forget to visit Mote Marine! 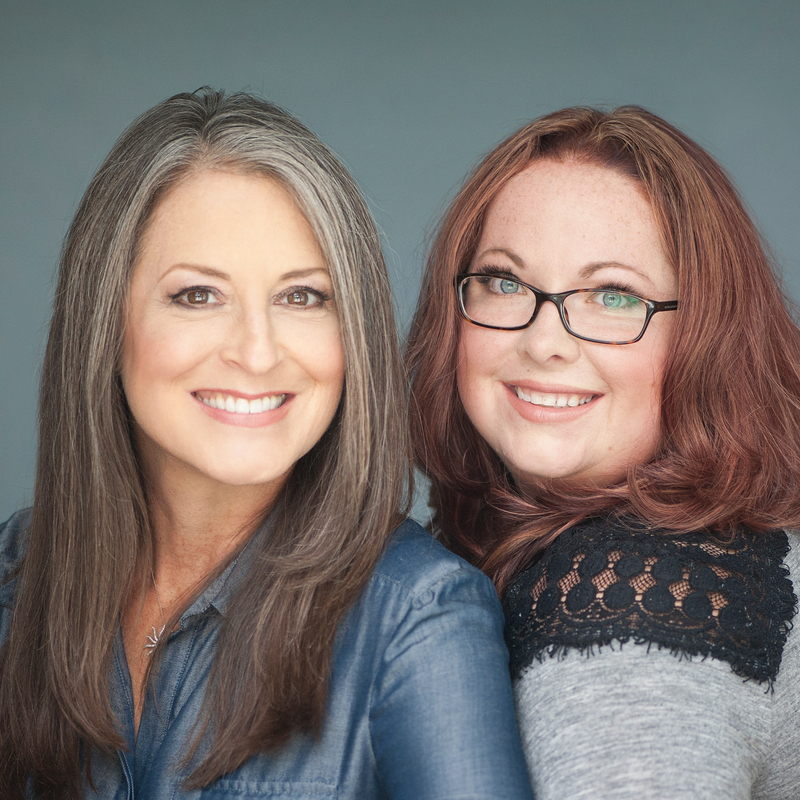 About the Author - Jenna Hatfield is a life-long resident of Bonita Springs, Florida and mother of two boys. 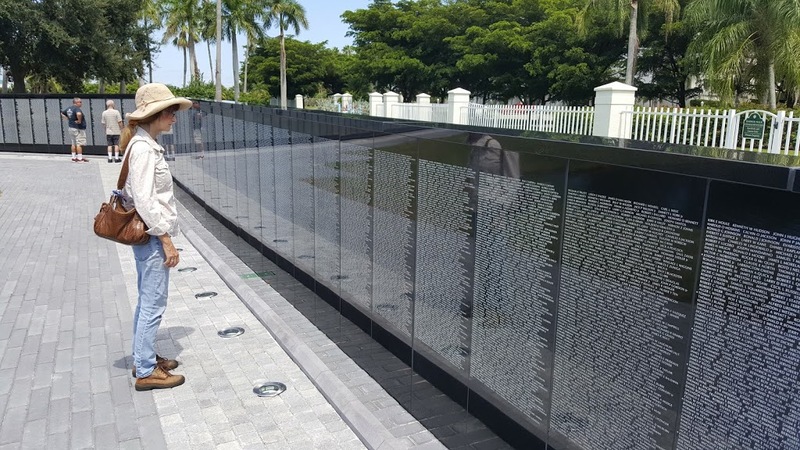 The Vietnam Memorial Wall of Southwest Florida is locate in Punta Gorda, Florida about an hour north of Bonita Springs, Florida. A few years ago Jerry and I drove up to visit it and see how they categorized the names on the wall as well as the engraved bricks on the ground. Jerry is the force behind the Collier County Freedom Memorial so we were doing field research. We’ve seen the actual Vietnam Memorial in Washington DC while serving with Honor Flight. As promised the Vietnam Memorial Wall in Punta Gorda is a half scale replica. It’s amazing to see and we had no idea that it was available to see until we had started Googling war memorials around the area. While we were visiting there were two men who walked up to the Vietnam Memorial and paused. I must have looked official because one of the men asked me if I could help him find his brother. I am not shaken by much but I can barely stand seeing old men with trembling chins. He was overwhelmed and explained he had never been to Washington DC and would probably never get a chance to go but he was able to make the couple hour drive to see the Vietnam Memorial in Punta Gorda. I located his brother’s name online and showed him how the marking system works. We found the name in short order and I immediately walked away because I knew he needed to be alone there. It’s humbling and heart wrenching to see in person. There was so much loss and so much pain remains. Before you go, you may want to look up names online so you can find them easily. It is hot and not shaded. You will also be fairly close to a few restaurants so if you do make the trip and it’s a day trip you can easily find rest rooms and a bite to eat before heading home. Names are not in alphabetical order but in the order of date of death or date declared missing in action. To find names on the wall visit: http://thewall-usa.com/index.asp#search or download “The Wall” app to your smart phone. I just named it after my Dad, because I never was able to find an official name for this little path that we used to go walking on in the mornings for a few years. This would be the second stop if you were to park at the Airport parking lot, which is also the designated parking area for The Gordon River Greenway park. 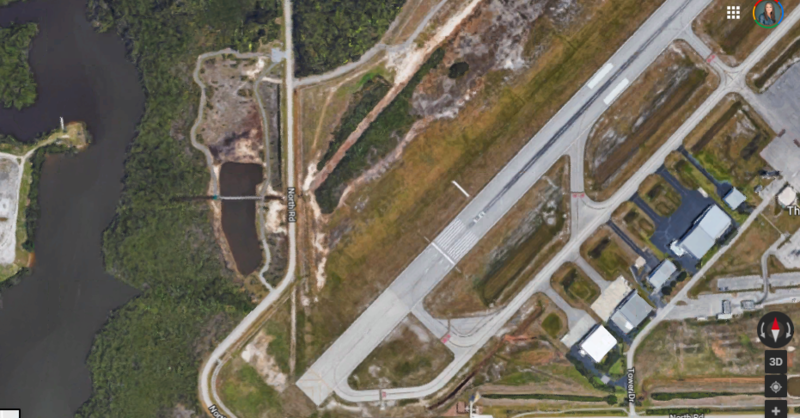 The bike path runs past the Airport Observation Deck around the west side of the runways and then back East back towards the airport. The path crosses the road just after it comes out of the curve, so use caution, and then is basically a wide spot in the road until you get to the South pedestrian entrance into the Redevelopment Area. The asphalt path includes about a 2,000 foot loop around a retention area and pond, with a wooden bridge that crosses the pond. There is a shaded area with a bench at the end of the bridge where you can observe which way the tide is flowing, as the pond connects to The Gordon River which flows out through Naples Bay and into The Gulf of Mexico. There are a couple of other benches along the path, but other than that, there are no amenities: No water, restrooms, picnic tables, or even trash cans, so pack out whatever you pack in. I used to see a lot of dog poop, so I guess it’s pet friendly, but since there are no trash cans, maybe I shouldn’t say that. There is a handicapped only parking area at 485 North Road with 4 parking spots. The newest thing about this park, is that they just completed a bridge over the Gordon River that connects to Baker Park that opened in March, 2019. The bridge takes you high over the river, so you get a nice breeze and views. The path goes around Baker Park, and if you follow it straight, it ends right at Central and Goodlette-Frank, so about another mile West and you’ll be at the beach and close to downtown. Pretty cool stuff!